Our group of 16 world travelers arrived safely home this past weekend from our 4th annual Devanadi Journey to Thailand group retreat. I’m now two days into my jet-lag and doing very well, surprisingly… until this past night. I tried to stay up a little later just to sleep through the night and whoops! I entered Pitta time! Thus, this blog shall be written. To help, I’ve leaned on my Ayurveda training and remembered to 1) oil my feet with sesame oil at night, wear socks and flannel pajamas (COZY! ), 2) take a daily Triphala capsule to regulate digestion, 3) stay hydrated with mint and ginger tea, 4) practice Yoga Nidra during the mid-afternoon (as opposed to crashing at 4pm and waking up 6 hours later – NOT great for sleep recovery! ), and 5) meditate and do Nadi Shodana before bed. For this post, I’ve chosen to comment on some of the unique therapies we experienced while abroad. Not only is Thailand famous for its Thai Massage (Nuad Boran), which we also specialize in here at Devanadi, but also is the home to many other traditional healing methods that have amazing effects. Some of our group took a 5 day training on Chi Nei Tsang with beautiful and dedicated teacher, Ohm Rinraya. This is the abdominal organ massage method practiced by the original Chinese Chi masters and is taught often now in northern Thailand. We LOVED the training, and really feel excited to practice and study more. Not only is this work deeply detoxifying, but also helps place the organs in their “home” position. Childbirth, injury, bad posture/diet, stress, etc. wear and tear on the abdominal area. We all felt like our INNER body really received a huge cleanse physically as well as emotionally. I’ll be offering Chi Nei Tsang soon at Devanadi… as soon as I practice a little more. In this photo, skilled Russian bodyworker, Levan, makes working with his feet look amazingly simple. Pati was treated to a fabulous neck, shoulder and back sequence as Levan coached us along. I recently did the techniques on Jason (my husband) with glowing reviews! Now who wants an appointment…? Ok, this photo might make you cringe, but it’s just a temporary effect from a therapy called Gua Sha, or more commonly in Thailand, “Hak.” Most of our group, myself included (although the photo isn’t of me) received this simple yet effective work using a polished white buffalo horn, oil and elbow grease. Literally “scraping” the skin, toxins – shown here as the redness – come to the surface much like cupping in Chinese Medicine. The redness lasts up to four days, but the effect is immediate. Many of the receivers reported feeling tremendous relief and opening. For example, after my session, my shoulder blades felt like they had wings! Some of you might have heard of Tok Sen, or “hammering out” the Sen, or energy lines, with a little wooden mallet and tool. The therapist taps on the body such as down the side of the thigh and guides the tool in a line to help smooth out stuck chi in the meridians, muscles and tendons. Although it might seem irritating to be “knocked around” for an hour or two, recipients report that the effect is very calming and relaxing. We had a fair amount of Tok Sen tapping going on at my teacher, Pichest’s, too. It’s great to see these old forms of healing making their way into our learning environments. Lastly, there’s hardly a time when I don’t take students to the old Chiang Mai Reflexology Center. I got a tip from another Thai Bodywork teacher several years ago, and dang! This is the real deal. As a part of the government’s aim to rehab convicts, many are trained in both Thai massage and Foot Reflexology. This particular massage spot has ex-convicts doing the work, and boy do they go deep! I’ve seen squirms, heard squeals and have had to take a break myself from this intense work. 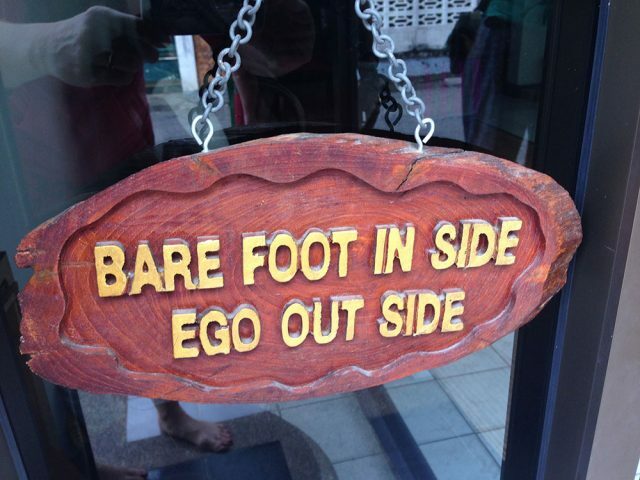 On the other hand, there’s plenty of poor foot massage all over Thailand (think 1 hour of someone lightly rubbing lotion on your feet without any pressure), so you just learn to grin and bear it, and see if you come out affected positively or not. I’m astounded by how much energy and healing can happen on a trip like this. In this country of metta (loving kindness) where coconut shakes and kao soy (northern Thai curry soup) are deliciously satisfying and nourishing, our 2013 Journey to Thailand was definitely an OJAS-FEST. Many of you have let me know you intend on taking this trip with me in the future, and I encourage you do so! Here’s to YOUR health – Sawatdee Ka!